No Hopkins president has opted to live on campus since Lincoln Gordon stepped down in 1971. But Brody, whose strong ties to the Medical Institutions in East Baltimore are already well established, wanted to send a message: namely that he and his wife intend to become an integral part of campus life at Homewood. And what better way to do that than to put yourself where the action is? "One of my goals is to improve the quality of life on and around campus," he told me. "By being here we can get a better sense of what changes might be needed." The Brodys inherit a home with a colorful history. The stately two-story Georgian house came to be in the late 1950s, when trustee Thomas Nichols was trying to woo Milton S. Eisenhower to Hopkins. Eisenhower told Nichols he had always lived in a president's house, first at Kansas State and then at Penn State. "Fine," said Nichols. "I'll build you one." And that's exactly what Nichols did, commissioning a slightly scaled-back version of "Rolling Ridge," his own sprawling home in the Greenspring Valley. Eisenhower moved in in 1959, bringing with him his longtime housekeeper Margie Morgan; her husband, Charles; and their pet monkey (which spent most of its time in the basement, but was occasionally spotted swinging from the trees in the backyard.) Eisenhower had a light out front that he used as a form of invitation; when it was lit, students knew they were welcome to drop in on the widower for an evening of informal conversation in the library--which many of them did, regularly. Unfortunately, Eisenhower's successor did not have such a good rapport with his student neighbors. At one point during Gordon's brief and turbulent tenure (1967-71), students took to angry protest on the front steps of Nichols House over a drug bust in the dorms. When Steven Muller came to Hopkins in 1972, two preteen daughters in tow, he and wife Margie thought it prudent to find a less public setting for their family, so they settled in Timonium. 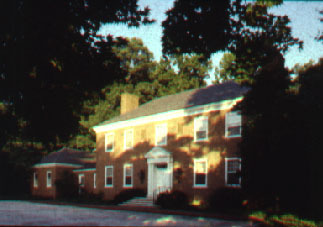 Bill and Nancy Richardson bought a house near campus, in Guilford. In the intervening years, Nichols House has served as a bed-and-breakfast for important visitors (including a wildly carousing Boris Yeltsin), a site for staff offices, and as a movie set; in The Seduction of Joe Tynan, the living room was the scene of a drunken "Capitol Hill" party, during which a grand piano was pushed through the bay window. The Brodys deserve credit for making a choice that is both good for Hopkins, and brave. Here's wishing them happiness in their new home!